But if I expect you to jiggle the numbers and budget $75 for a massage every week, month, or quarter, it’s my job to tell you what you’re buying. So here it is, what you get from a 1 hour, $75 massage, at the office of Annalisa Derryberry, LMT (MA43061 MM30953). What I charge is clearly listed here, and there’s no difference in pricing between the types of work I do, either. Scheduling tends to be the second biggest obstacle to getting regular massage. We never think of scheduling massage at a time that is actually convenient to call. You can schedule with me online right here. And if you don’t see a time that works for you, get in touch with some times you’re looking for and maybe I can make it work. Want me to spend the full hour on your feet or head? Sure. Warm table? Fan pointed in your direction (or turned off instead)? Not a problem. I’ve had 13 years of practice and hundreds of hours of continuing education. They were all just prep for your massage. I know non-painful ways to assist a tight psoas, and how to give a deep massage without pain. If lying flat is a problem, I’ve got tons of pillows to help you get a great massage on your side, and if getting up and down off the floor is an issue, we can do Thai massage on the table instead. We can even do a little Thai before your regular massage, if that might help loosen things first. We can improvise! I won’t practice any techniques that are unsafe for you and your health condition. This is why you fill out a detailed health intake form when you first come in—it’s important to know if you’re on blood thinners or if you have cancer, for example, because certain types of massage could be contraindicated. And if I come down with the flu, I don’t want to give it to you, so I will contact you to reschedule (and hope you’ll do the same for me, should you get sick). There are plenty of massage therapists offering discounted massage, operating under the radar. They may not have a practitioner license. They probably don’t have an establishment license or insurance either. You can check all that here, and also report unlicensed activity. Did you know in FL, we are licensed under the Department of Health, and get inspected at least once a year? My MA (practitioner) and MM (establishment) numbers are displayed on virtually everything with my name and/or business address, and I also carry liability insurance through the American Massage Therapy Association. 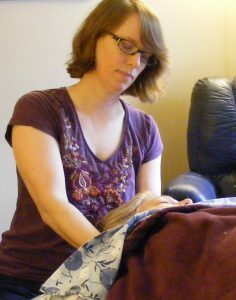 A massage with me gets you connections with all the practitioners I know. And that’s a lot of people. If massage isn’t helping your tendonitis/backache/anxiety, I’ll help you find the right acupuncturist, chiropractor, or counselor for you. I only use the best products on your skin. I mainly use Pure Pro Hypoallergenic Massage Lotion. The lotion is one of my favorites because it is unscented, hypoallergenic, and paraben-free, plus it doesn’t leave you feeling all greased-up afterwards, and it washes off easily. It’s just me! No conglomerate. No fancy management structure or corporate set up. Just a little business owner, paying her taxes, making a living, and participating in the same communities she serves. There are fewer and fewer businesses that can stay afloat in an era of big box stores and chains. When you pay $75 for a massage, you can be certain that money is staying in the local economy.